That’s Not A Dog! That’s A Tongue With Eyeballs! Our pug, Stewie, is guilty as charged! Rising country group The Band Perry just helped the Humane Society of Tampa Bay “clean up” at their recent charity dog wash. The group, sister Kimberly and two brothers Neil and Reid Perry, were hands-on at yesterday’s fundraiser — or more accurately “hands-wet” — washing dogs all morning at the event. The group’s members are passionate pet lovers, and made a donation of $10,000 to the Humane Society of Tampa Bay, according to a report from The Boot. The Band Perry was in Tampa opening for singer Tim McGraw on his Emotional Traffic tour. I think we’ve said it before. 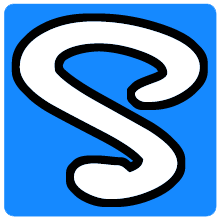 At Sniff Seattle Dog Walkers, we understand that every dog and every situation is different. Another example is Chica from Bitter Lake, the ball of adorableness pictured above. Her owner just got her and like many of us works all day. Well, as you know, a new puppy has a lot of needs. So Chica’s spending her days at our house and we’re helping build all those important feeding and potty routines, giving her plenty of exercise and play, and socializing her with other dogs. Doggy Daycare is not something we put on our list of services when we started. But after talking with her owner and meeting Chica, we knew we’d be able to help! “Signs, signs, everywhere there’s signs…” Here are another five signs that were posted by readers of Top Ten List: Signs You’re A Dog Lover. Thanks to everyone for these! They’re great! » Your Black Lab hates water. So when you take her out, the umbrella’s over her, not you! » You drive 20 miles for holistic dog food and treats, but there is a Pet Club less than two miles from your house. » You know you’re a dog lover if every set of glasses in the house has fallen victim to the dastardly wagging tail and is one or more short. » You have kiddie locks on the cupboards but no kiddies. » If you have a number of one shoe pairs. Or are missing socks. Or have holes chewed in your underwear in embarrassing places. 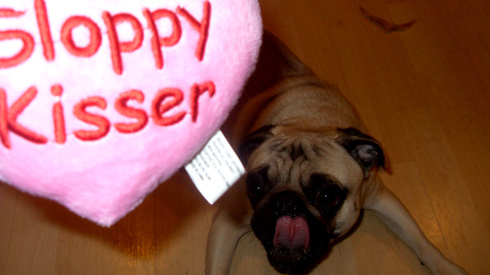 If you want to see more, check out Readers Respond: Twenty More Signs You’re A Dog Lover. 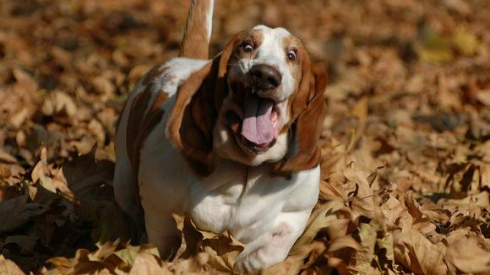 Pics: When Basset Hounds Run, Get Ready For Fun! These loveable guys have soooo much skin that when they start running…watch out! Here’s a great “pick-me-up” for your day. Check out these pics — 50 Photos Of Basset Hounds Running! Ready to see the “Top Five Rapper With Dog Names”? Count ’em down HERE! A new study seems to suggest that females dogs are smarter than males. Jeanna just said this is true of any species. The study was conducted…wait, what?! Here’s more about the study. Pay close attention to the part that says researchers can’t say whether the male dogs didn’t notice the size of the ball was changing…or didn’t care! ‘Cuz as I guy, I can pretty much confirm that’s what’s really going on here, lol.